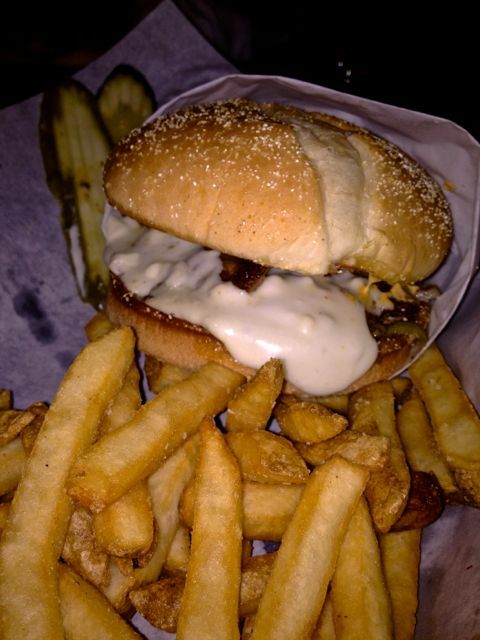 If you are looking for the best burger in Portland or a burger with creative toppings, then Killer Burger is your place! Killer Burger is not close to us at all. I had a reader insistent that I go check this place out. When readers get like that, you need to get on it, because it means you are missing out on something good. Thanks Dan! My husband had the special, which was $9.95 I had the Blue Cheese burger which was $7.95. All burgers come with fries, great fries too. As we were waiting for our food to come out we got to talking to a couple that were regulars there. First question they asked was “What burger did you order?” We told them and they said we needed to go back and get the Peanut Butter Pickle Bacon Burger. I was super hesitant, but they insisted. (Are you seeing a theme here with these regulars?) So we went and ordered the Peanut Butter Bacon Pickle Burger “Girlie” size for $5.95. So now we have 2 people 3 burgers. Heck Yes! We also grabbed beer, the Bloodshed Red Ale beer, which they brew. It was so good I went back for a second. Now I have 2 beers, and 1.5 burgers. Don’t let the Peanut Butter Pickle Bacon burger scare you. It’s a very savory flavor. I don’t even like peanut butter or pickles, but this combo is incredible. I would have never thought to put this together. The Blue cheese was too much for me, I didn’t really like it. My husbands special was very, very, very good. He didn’t even want any of the Peanut Butter one because his was so good. Bread is a huge deal to me. Theirs was perfect, but I have to admit I still had to take the top bun off. So sorry, but I wanted some fries and that was just too much for me, but it was still amazing, even though I bastardized it. My husband even looked at me as though I was cheating on Killer Burger themselves. Please don’t judge me. The fries were also perfect. You know how you always reach for the crunchy fries first? Well they were all crunchy, nothing mushy. One thing you need to know about me is I eat really good. For dinner the night before I had made roasted veggies over Quinoa. When I eat burgers out I get sometimes sick, because I just don’t typically eat burgers and fries. They always taste good going down, but about 30 minutes later and it’s all regrets. That was not the case with this burger and fries. I never felt sick. This is a quality burger. The place is very small with limited seating. We were assured that we would be able to get a seat if we waited until our food came out and sure enough we had a seat. After we sat someone came out and wiped our table down. That happened every.single.time someone left and a new group sat down. WOW!!! They also have a Crazy hour in which you can get a great price on burgers. Check this out. UPDATE :: Just tried out the new location in Sellwood and was very impressed. It’s quite a bit bigger than the Sandy location, which I thought was nice. It was still pretty busy, like the Sandy location. The staff was really great. Seems to be a running theme for Killer Burger. 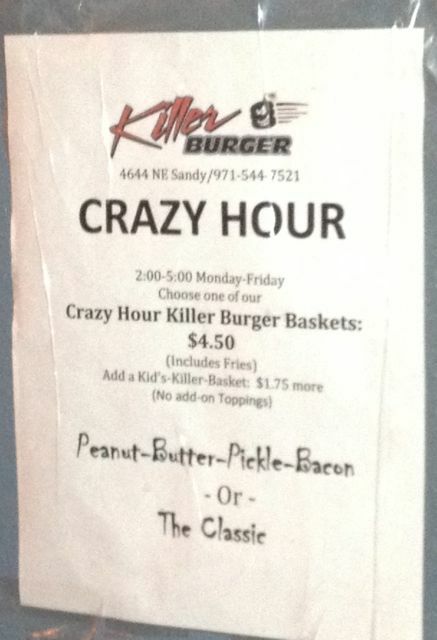 Another Update:: Killer Burger now has multiple locations, so there is no reason not to try one. Atmosphere was tight, but very cool on the inside. It kind of reminds you of a bar, not sure why I think that. Pricing was good. Burgers were very large, great quality and very, very creative toppings. They had beers in a can and a few on tap. Pretty good options for a place that small, I must say. Service was so great. They were very helpful. Excited to see new faces and let us know how the whole system worked, with ordering, seating and getting it to go if you had too. They kept the place cleaned up too, loved that. Located way to far from our house, but on NE Sandy Blvd. Sorry the review was so long, I just couldn’t get over how great this place was. BEST burger place yet! I have been twice now since you told me to check it out and both times had the peanut butter, pickle, bacon burger! Sounds weird, but so DELISH! Thanks for the recommendation! So glad you love it! It is such a great burger. You are so welcome! Glad you enjoyed it. Of course, when you really like something to the point of being a little obsessive (or oppressive? ), you really run the risk of building up too much anticipation and it bombs. I knew you’d like it, though! I’d be happy to recommend anything else for you to check out!